Green Screen or Chroma Key Photography is a photography style in which we shoot pictures with a solid color in the background so that it becomes easy for the editors to replace that solid background with beautiful backgrounds. This kind of photography is mandatory for every motion picture that involves graphics. 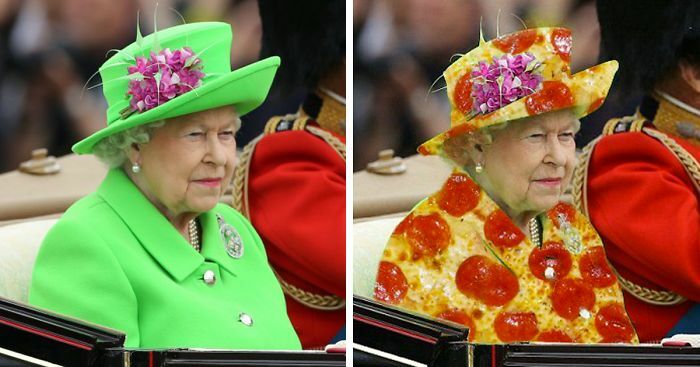 Why we use Green Screen? We can choose any color for the background screen, but the only thing we need to care about is that the background color should not be present on any part of the foreground subject. 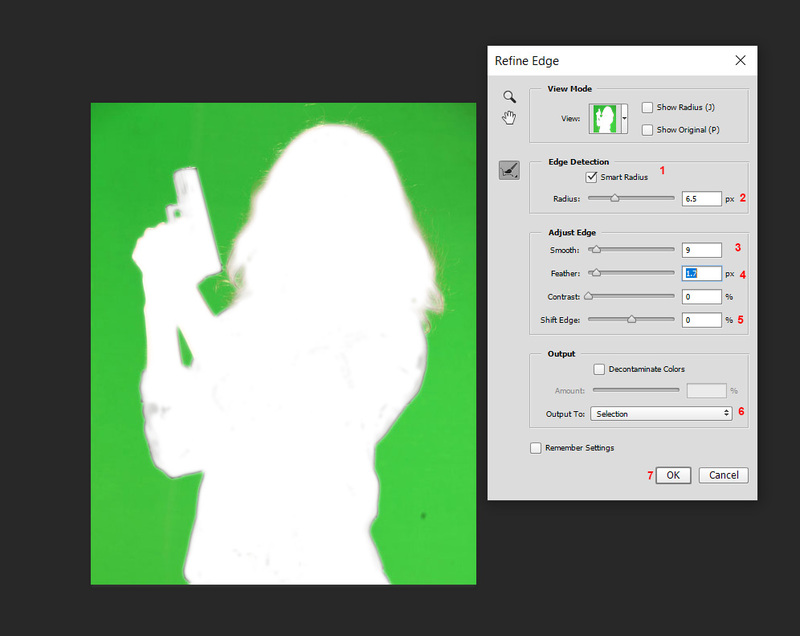 Suppose we are shooting a person who is wearing a green colored shirt and our background screen is also green colored then it will become hard to edit the picture. You can still think of working on such images but it will require a lot of unnecessary efforts. Which is not available in case of LIVE events like News Reporting, because whenever they are live the software automatically converts the green color present in the scene to the background that is being shown like in case of Weather Forecast etc. That is why news reporters and actors are so careful while picking their dress for their shows. The most important factor for using green as the background screen is that it doesn't conflict with any color of out body parts. 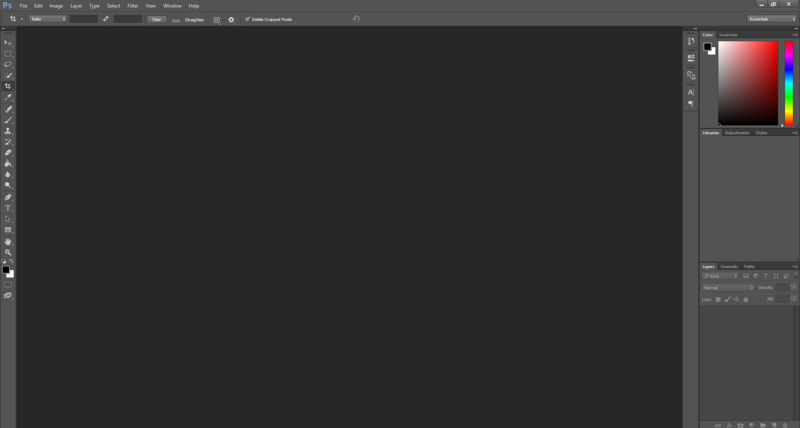 Suppose if you are using black as your background chroma screen, then the color of your eyes, hair or sometimes even shadows are mixed with that, making it hard for editing. Even if you try to use the color red, it might end up matching color of the foreground subject's lips. 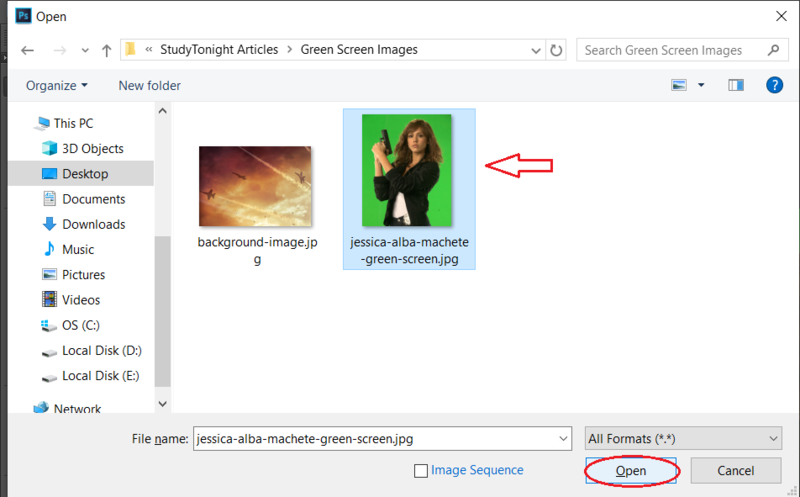 Most of the film editors use Green screen and some times Blue screen if the actor has to wear green coloured clothes for some scene. Following is the image that I will be using in the tutorial. If you want this image for practising please follow this link (Green screen image) and save the image. 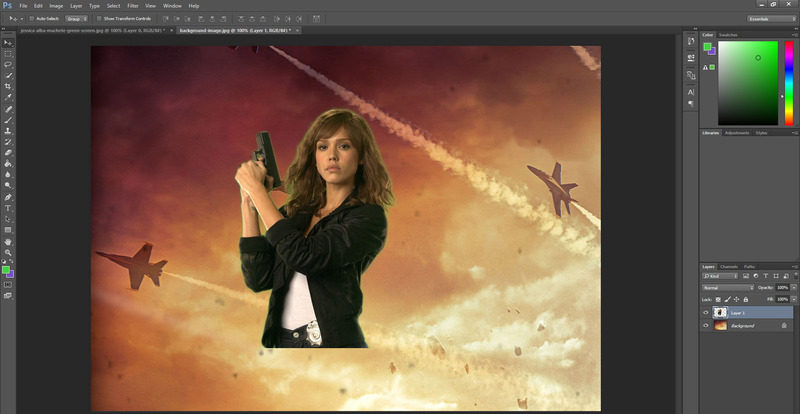 To add the images to our Photoshop project, simply click on File > Open from the menu on the left. Or you can simply click CTRL+O to open the file dialog box. 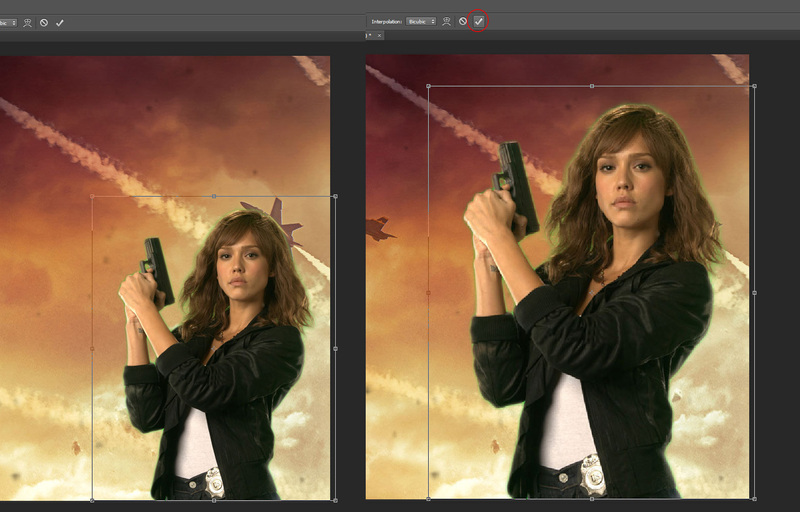 Photoshop supports drag and drop option as well, so you can even drag and drop the image into the window. 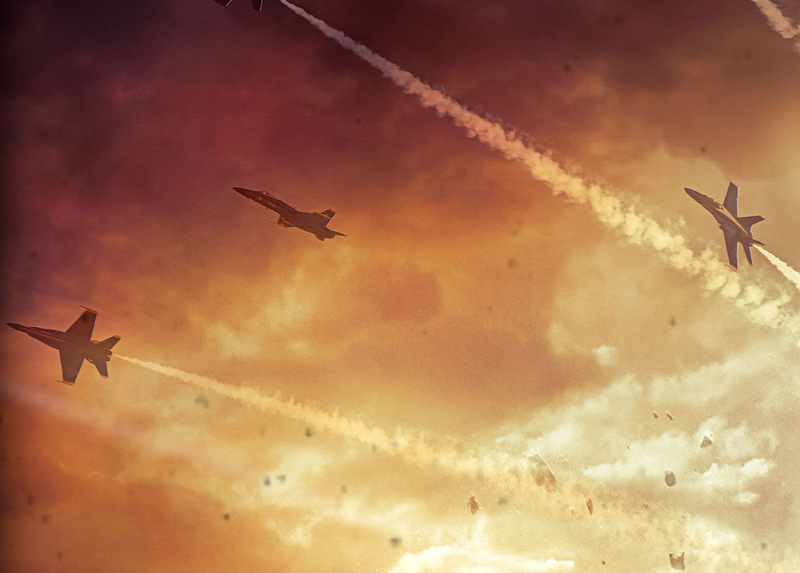 Similarly, you can go ahead and open the Background Image also. 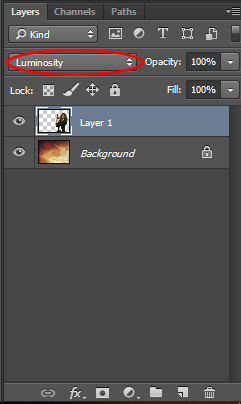 Now in the layer's section present on the bottom right side of the Photoshop window, you can view that the image we used is presently named as Background. After clicking on the layer it gets highlighted as shown below. Click on the lock symbol, after clicking on the lock symbol it will disappear. We are disabling the lock on the image so that we can edit the image. Remember that whenever the lock symbol is turned ON on a layer we cannot edit it. 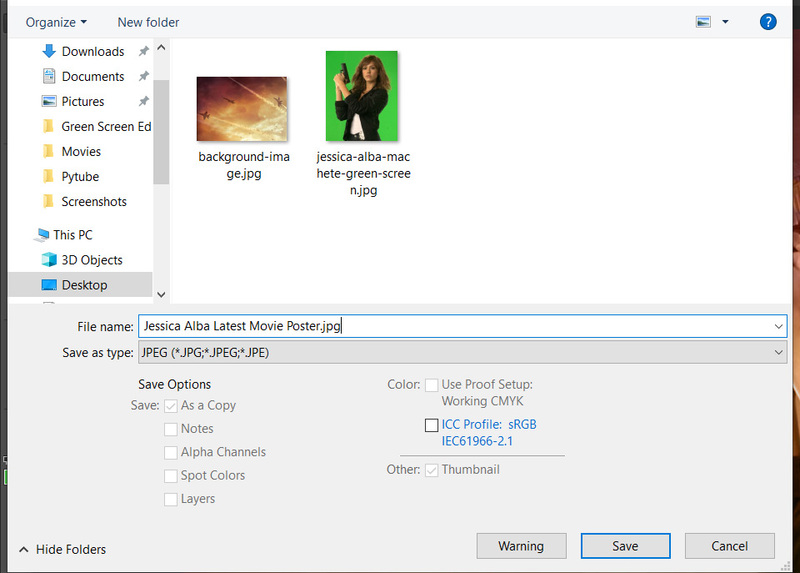 Observe that after removing the lock symbol, the Background named image is converted into Layer 0 and also some of the editing options are enabled. 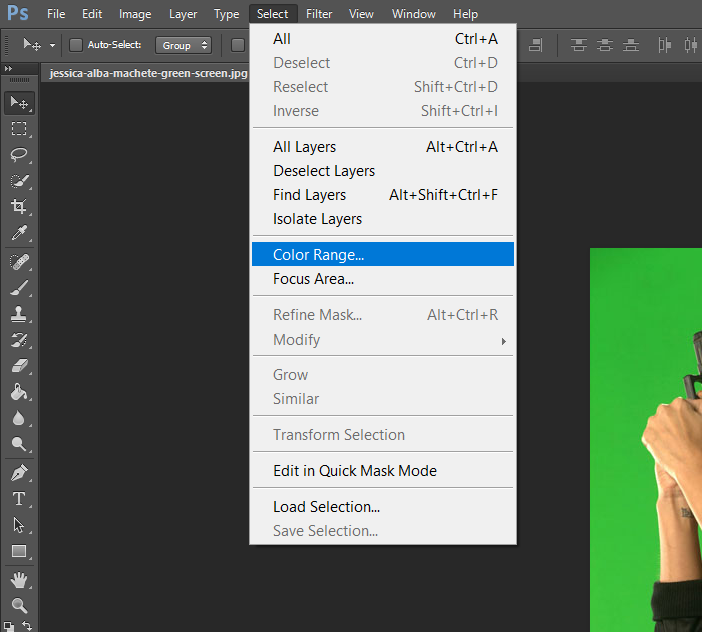 The Color Range window will open where you need to select the Color that is to be selected from the Image. 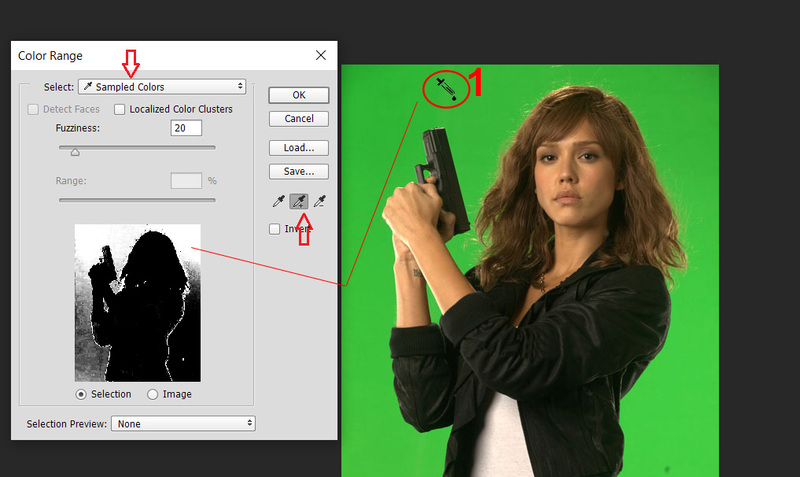 Observe that the Color Picker tool must have + symbol, now hover on the original image and Click on Green Screen, here I have selected twice as shown via Point 1 and Point 2 on the image, and in the Color Range Window we can observe that the image is shown as Black and White mask. Here White color represents the color selected in the original image. Whenever we change the value for smooth, the edges become smooth. Adjust as per your requirements. Feather option will give a fade-in effect to the edges. Since we need not to shift the Edge, set the value of the Shift Edge to zero. 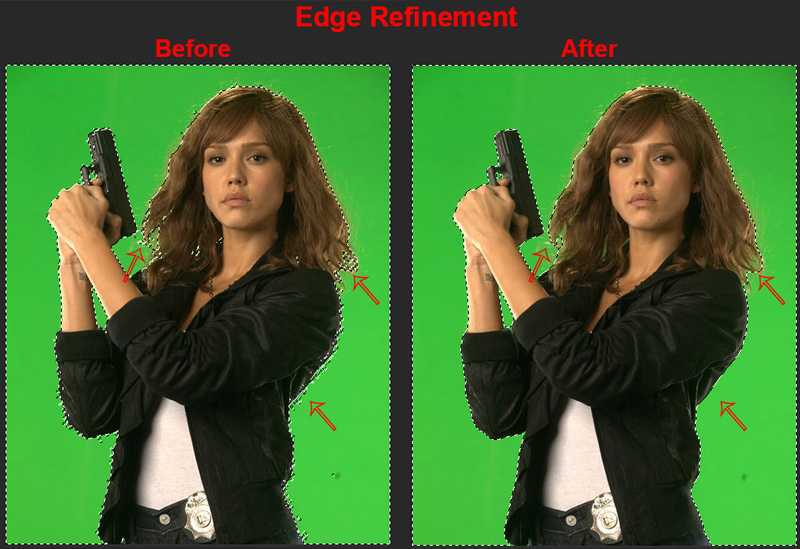 The output of the Refine edge should reflected in the area of selection. Now click on OK and see the change in the selection. Observe the wriggling edges are now changed to smooth and fine edges in the selection. Make sure that Move tool is selected which is a tool on the top of the toolbox (marked in the image above). If you are not sure whether the Move tool is selected or not click V which will select the Move tool. 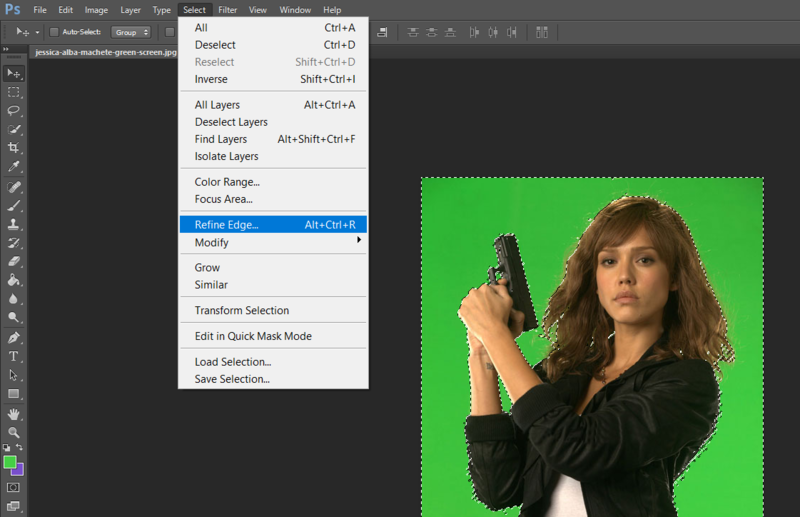 Now with the move tool selected, click on the image (Jessica Alba's Image) and drag the image on to the Background Image tab in the photoshop and release the mouse inside the background image. Now adjust the image by dragging it around to any position. 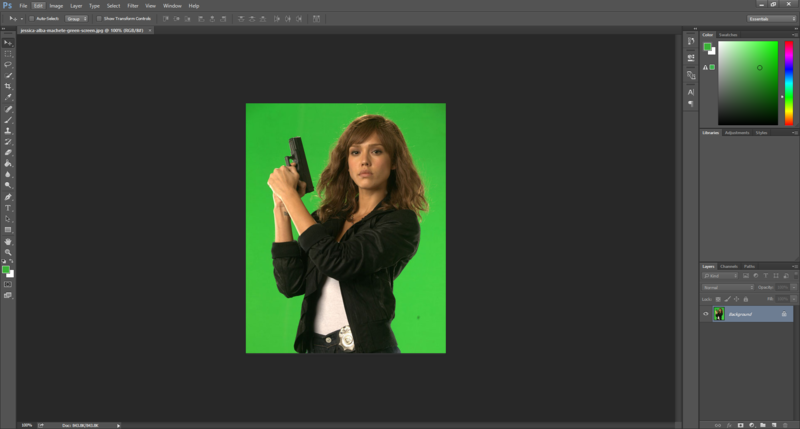 Once you are finished positioning the layer on the background image, press CTRL + T, this command allows you to transform the image. 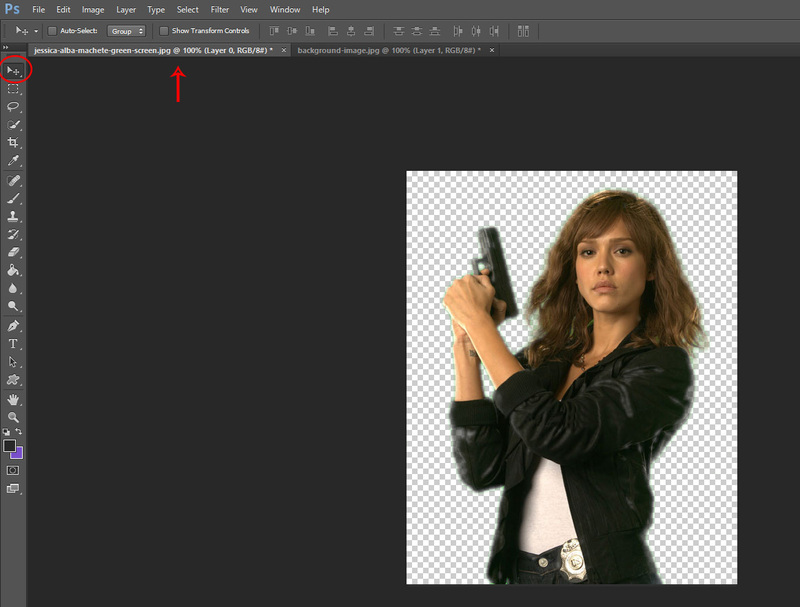 To transform the image place your cursor at the edges of the selection as shown, and then resize the image. 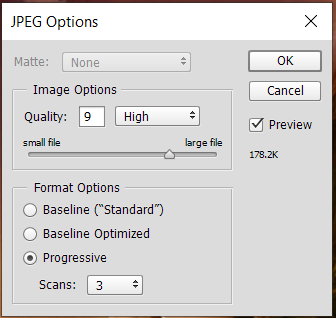 Once you finish resizing the image click on the Tick symbol shown on the top. That's it you have your green screen image with a beautiful background. 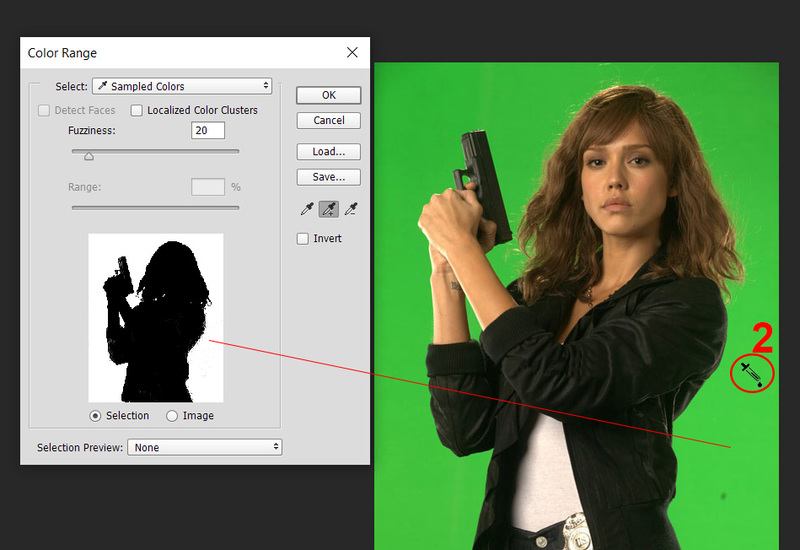 You can add some more effects to the foreground layer(Jessica Alba's image) by changing the layer style. 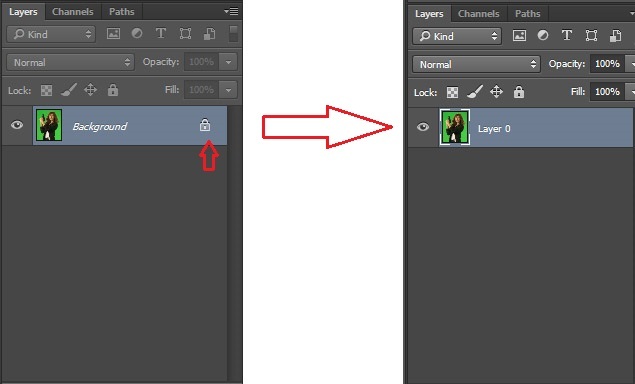 For this click on our Layer 1 and change the layer style from normal to Luminosity from the options available. You can select any layer style based on your requirement. When you are done and satidfied with the edits, press CTRL + S to save the image, in the Save menu select the file type as JPEG or PNG and click on Save. Congratulations! you just photoshopped a green screen image. Go ahead and create awesome edited images and post their links in the comment section below.